1. 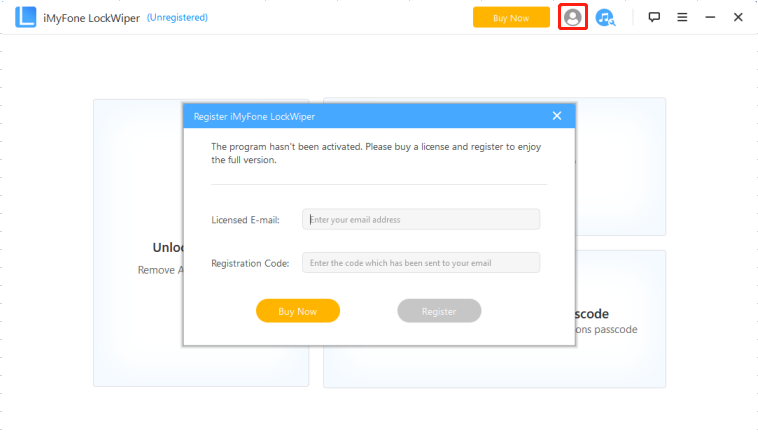 How to register iMyFone LockWiper? Step 1: Please install and open iMyFone LockWiper on your computer. Step 2: Click on the user icon at the upper right corner and choose “Register”. The “Register” window will pop up and ask you to register. Step 3: Copy and paste your licensed email and registration code there. Click “Register” to activate it. Now you can enjoy the full functions of LockWiper. 2. Will iMyFone LockWiper erase data on iOS devices? Yes, both Unlock Screen Passcode and Unlock Apple ID mode will erase all the data on your iDevice. For Unlock Screen Passcode mode, it will also update your iOS version to the latest one. 3. When do you need to unlock your iOS screen lock? When you forgot your iDevice’s passcode but you want to access it to perform more operations. Your iDevice is disabled after you input several wrong passwords. When you get a second-hand iPhone/iPad with locked screen and you need to unlock it before you can use it. Your iPhone/iPad screen is broken and can’t be used. Your iPhone/iPad passcode was set by others and you don’t know the password. 4. Do I need to install iTunes when using iMyFone LockWiper? Yes, please keep iTunes installed on your computer when using iMyFone LockWiper. If you do not install the iTunes, your device may not be recognized by our program. If you don’t have iTunes on your PC/Mac, please go to the official website and download the latest version of iTunes. 5. What if my iOS devices could’t connect with iMyFone LockWiper? (1) Unplug and re-plug in your device. Restart the program and connect again. (2) Check the USB connection, try to connect to a different USB interface with your original USB cable. (3) Check if iTunes could recognize your device. If iTunes cannot recognize your device, please use iMyFone TunesFix to repair your connection issue. 6. What kind of screen lock can iMyFone LockWiper remove? 7. How do I know if the Apple ID on the phone can be removed? Download the free version of LockWiper and launch it on your PC or Mac. After connecting your device to it, choose the Unlock Apple ID mode. If your Apple ID can be removed, you can continue the process by clicking “Start to Unlock”. If your Apple ID cannot be removed, you will see the message “Your Device Is Not Supported”. 8. Can I remove my old Apple ID without password and create a new one? Yes, when you can access your device, iMyFone LockWiper can help you remove the old Apple ID easily without password. Then you can log in with a different Apple ID or create a new one. 9. Will the Apple ID be removed forever? Please note that the software is designed to delete/remove Apple ID from iDevice but not from Apple Server! So it’s not removed forever, please do not erase all content and settings and update or restore via iTunes after removal. 10. Can I update the iOS version after the removal? Yes, you can update your iPhone, iPad, iPod Touch to the latest iOS version wirelessly. However, you might not be able to update the firmware through your PC or Mac. 11. How can I delete an iCloud account of the previous user? You can use LockWiper to delete an iCloud account of the previous user. For devices with iOS 11.3 and earlier versions, LockWiper can help you delete it whether Find My iPhone is on or not. For those iOS 11.4 and above, the program can help you delete it only when Find My iPhone is off. 12. Can the previous owner trace the location of this iPhone after removal? If you have removed the previous Apple ID, you will be able to use your own Apple ID. So the previous owner will not be able to trace the location of your device. 13. Can the previous owner put the device into Lost mode after removal? If you have removed the previous Apple ID, you will be able to use your own Apple ID. So the previous owner will not be able to put the device in a Lost mode. 14. Can I remove the Apple ID when it’s in the Lost mode? If the device is reported LOST or STOLEN, then the device will be in the activation lock. In such situation, you might not be able to remove the iCloud activation lock. 15. On which Apple models can an Apple ID be removed? LockWiper supports to remove Apple ID from any Apple devices: iPhone X, 8, 8 Plus, 7 PLUS, 6S, 6, 5S, 5C, 5, 4S and 4. 16. On which Apple iOS version can an Apple ID be removed? LockWiper supports to remove Apple ID from any iOS version of Apple devices when Find My iPhone is disabled. If the Find My iPhone is turned on, it only supports iOS 11.3 and earlier versions. If you want to remove Apple ID from iOS 11.4 and above versions, you need to make sure the Find My iPhone is turned off. 17. Is it safe and legal to remove the iCloud account without password? YES, we are a company that served around 2 million customers from more than one hundred countries. The LockWiper Apple ID removal tool is totally safe and legal for our customers. We only help customers to solve problem and protect their privacy. 18. My iPhone is stuck on the Activation lock, can you help me? If your iPhone is stuck on the activation lock, then you might need to find back the Apple ID and password. The program can only help you remove the Apple ID when you can access to the device normally. 19. What to do if it failed to unlock my iPhone screen lock? (2) Restart and even reinstall the program if necessary, and then try again all the steps. (3) Contact the Support Team: you can directly send feedback with the log file and screenshot to them or just contact support@imyfone.com with detailed information. 20. How do I know which firmware should I download for my device when removing screen lock? Please note that the program will automatically detect the right firmware for your device, so just choose the provided one for you. If it failed to detect for you, you can download it by yourself by choosing the one that available on the page.